On Friday, I found myself drained by the naked hideousness of Christchurch. The footage was easily obtained, the meaning obvious, the facts bare. It felt personal, and in error, I believed it was due to the proximity, and the fact that it was one of us that did it. But as that afternoon shifted, and the salve of booze and denial wore off, the feeling remained. It wasn’t the loss I was feeling, it was a feeling of shirked responsibility. As someone who adds to the general narrative in this country, I have to accept my part in what revealed itself Friday, we’ve all been guilty of it. We’ve all been uniformly guilty of hunting for clicks and in turn, and our default is too often to inflame over inform. The narrative has since turned, as we’ve rallied around “egg boi” and his pocket full of shells; I fear that we’ve let the lesson sail over our heads. The conversation is now swirling around what constitutes assault, and the oscillating nature of Morrison’s response compared to Jacinda Ardern. We’re questioning leadership, but not showing any ourselves. The media is the mirror of society, sure, but too often free ourselves from the weight of memory, as the quicksilver nature of the business keeps us firmly planted in the now. On Friday, I watched that hyper-realistic tableau, grimly accompanying the gunman through the depts of his own hatred; it was obvious that he was manufacturing clickbait. We knew this, because he explained it via a manifesto and through his own grim narration. It was made to be shared, which is why racial epithets were painted on the means of his evil. By the time I had digested what I saw, the quicksilver fingers of elsewhere made it canon, publishing large slices of the video for public consumption. Clearly, the social media platforms couldn’t stop it from spreading beyond their reach. Clearly, the moral choice was ours, but we chose to proliferate the gunman’s message, ignoring the subtext in order to be first. We all covet the clicks and fear/long for the backlash. We’re more than part of the division in this country, we’ve helped build it. There’s nothing more visceral than anger. It’s why platforms are freely offered to these people. We oscillate between our fear of being dragged in the comments and wanting to advance the thrust of our respective publications. But understanding seems to possess less merit than finding the most incendiary voice to provoke discussion. There are some great journalists doing great work, but as an editor, the temptation to publish inflammatory garbage purely to provoke a response is a daily one. There always seems to be an audience, which makes seem like it a good idea. Even if it isn’t, people will forget tomorrow. We’re also abetted by all the other publications. “We’re not the only one promoting these far-right views, and we don’t want to miss out”, is a well-travelled mental highway. The feeling is to publish something and let the readers fight it out in the comments below. Considering anything can now be covered by the umbrella of “free speech”, oversight gives way to overpublishing. But those who solely focus on Fraser Anning in the wake of Christchurch are distracted by the odious pong of Australia’s most dead cat. 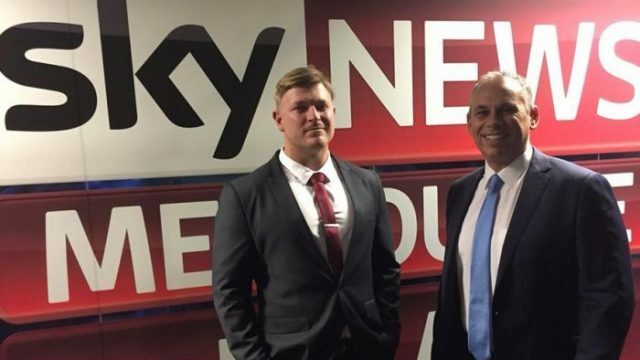 As both sides of parliament are now looking to censure him, they’re quietly drawing attention away from those who shook his hand or clapped when he referenced the final solution in his maiden speech. Similarly, those in the media who supported or gave a similar ethos inches are running for cover, now offering solid castigations of Anning’s tone. We’re a long way from the black-and-white dramatised world of William Randolph Hearst, where a manufactured lie is better than the truth, but we’re in the same ballpark. Statements are now questions, stands are avoided and labels watered down because we’re all seeking every possible eyeball. In the interest of self-reflection, here’s a piece we ran on the egg incident. Anning’s retaliation was most certainly assault, but we created a dialogue over taking a stand because the latter was clearly more advantageous. I can understand why we accede to this temptation. We’re all losing our jobs, and one day in the very near future we’ll all be swallowed by Facebook. Moreover, the country seems divided and sans an attention span, so why bother with an even analysis that no-one will read? It’s an easy trap to fall into. But writing to provoke has made us stupid and angry, and those we enabled along the way are now controlling the conversation. There’s no one person to blame, as it wasn’t one piece that made it ok, it was the hundreds that emboldened their step. It seemed fine at the time, as they didn’t seem dangerous until they were. We seemingly have no choice but to provoke, poke and jab at the reader base. Commentors are clearly more valuable than journalists. We can’t help ourselves. Malcolm Roberts fighting Brian Cox with a Xerox. Our Parliament voting on the merits of a racist meme. Mark Latham and Pauline Hanson on 60 minutes. It writes itself, which is certainly the problem. We need to keep them in check, yes, but we also need to focus on the cause-and-effect of this echo-chamber journalism we bow to. Last week, we had two great failings of humanity. For the species, it was an awful week. For those in the media, it was awful, but it was a good news week. To borrow from Macbeth, “I am in blood stepped in so far that, should I wade no more, returning were as tedious as go o’er” – essentially, Maccie Bees realised that it is easier to continue his bloody ways than to reverse course. We find ourselves at a similar pivot. It would be easier to continue to cultivate extremism as a normal part of our discourse, but with the blood of our neighbours now on our hands, our path should be clear.